← Where in the World is….? ArtWorks 2012: What’s in a Name? How often do you really consider the implications of naming something? 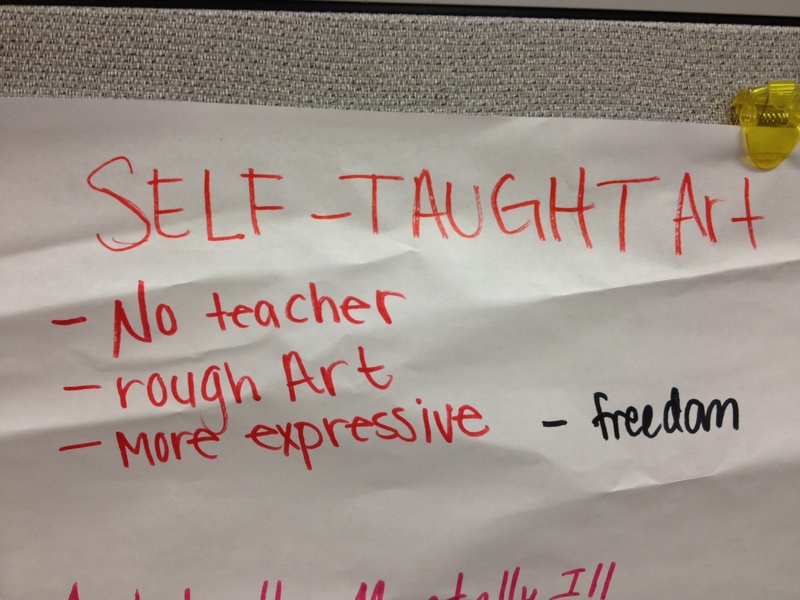 That is exactly what sixteen teens in the spring ArtWorks program here at the Museum did last Thursday. 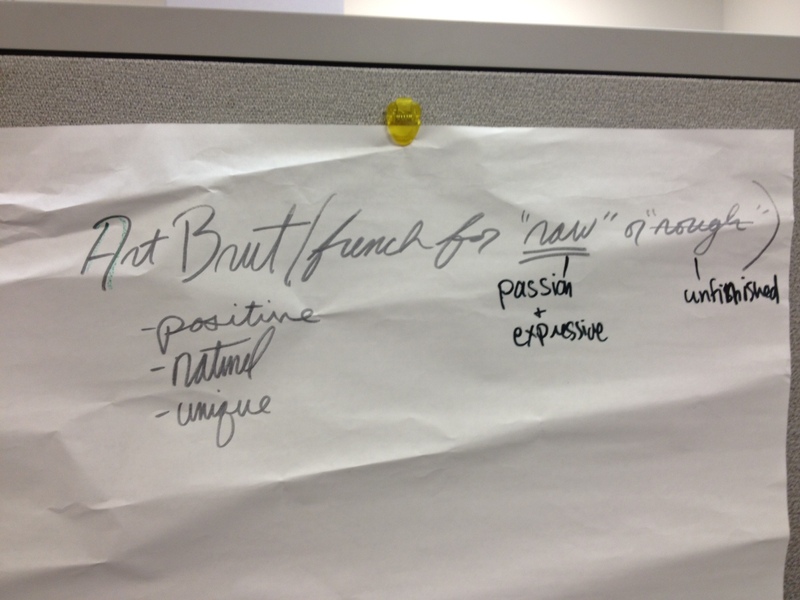 After looking closely at the artists and works of art in Accidental Genius: Art From the Anthony Petullo Collection, we worked together as a group to think deeply about the meanings of a name, how and why art is categorized, and whether or not such categories can ever really be correct. 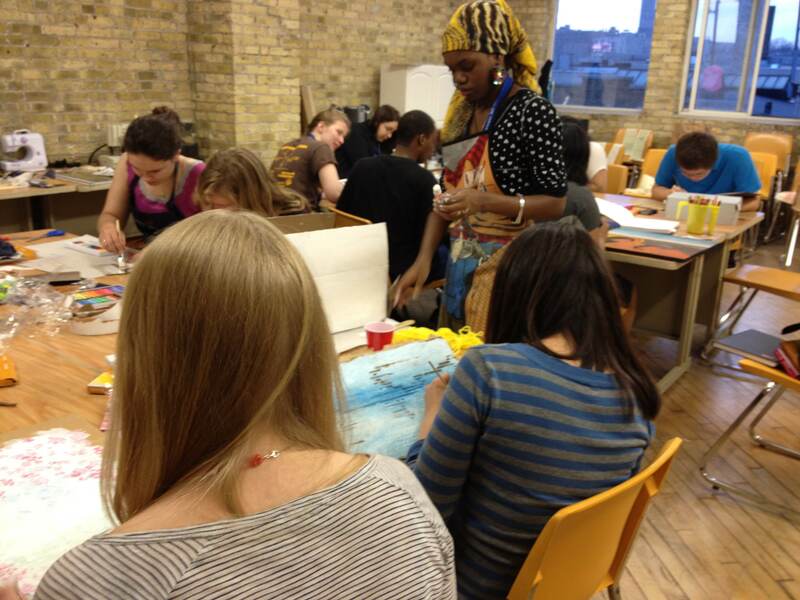 The ArtWorks program is an eight-week paid internship program for Milwaukee-area teens. 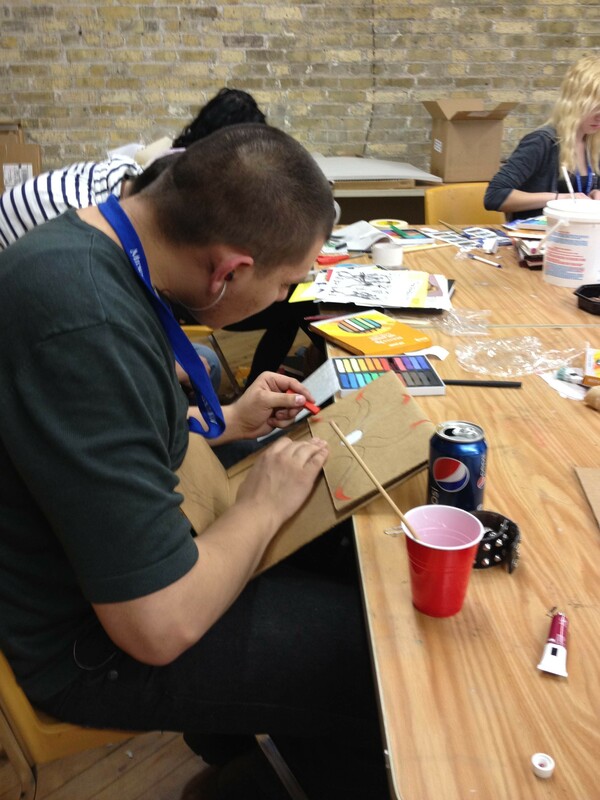 Sixteen participants work together to create a public work of art that positively addresses an issue in the Milwaukee community, this year inspired by the works of art in Accidental Genius. They also mentor young elementary school students, touring them through the exhibition and creating art with them. On the first day of the program, we spent a lot of time getting to know the exhibition. Each teen artist explored the show, then found and shared a “kindred artist”–one work or artist in the exhibition with whom they identified. You should know that self-taught art has been categorized in many different ways and with many different names, and art historians have difficulty deciding on one definitive term to call this sort of art. These artists come from many different backgrounds and the work itself can vary stylistically, which makes it difficult to go with any one term. 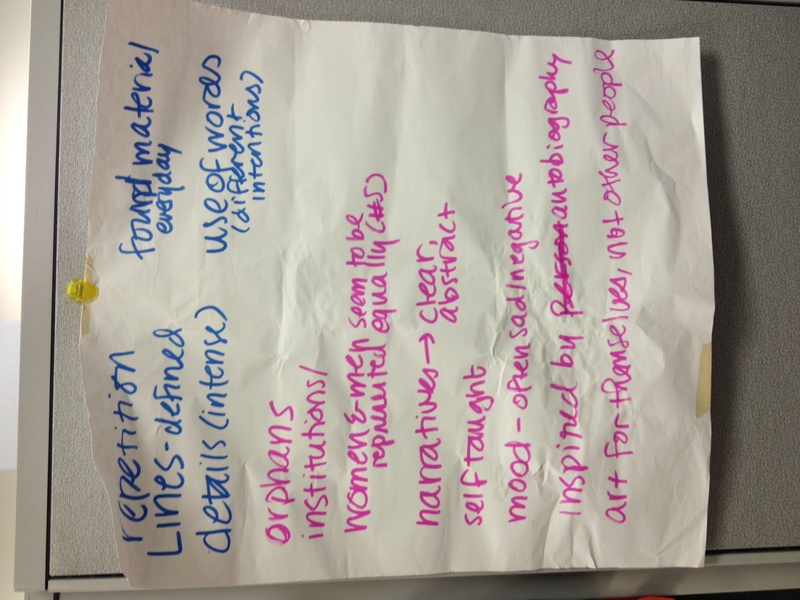 Together, the students discussed what comes to mind when considering each of the terms. What kind of art would they expect to see when they hear that word? What might they assume about its artists? What is implied about the works grouped under this name? And, further, having seen the exhibition, would this term be an accurate or appropriate overall term for the work in the show? We shared all of our discussions and ideas with the entire group, and I want to share their insightful thoughts with you. 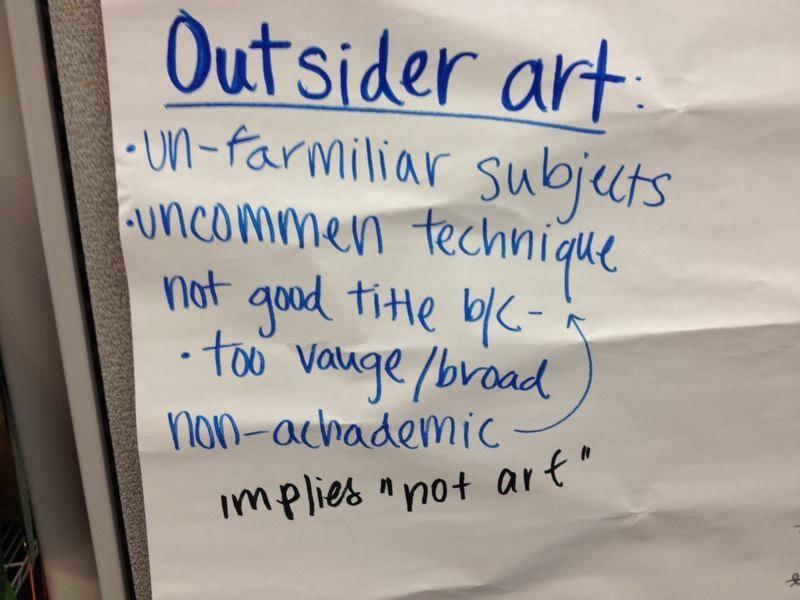 Outsider art was a tricky one. It implied unfamiliar subject matter, an uncommon technique, and, moreover, that the art was not actually art. It seemed to immediately ostracize its artists. We decided this title wasn’t a great choice overall because it was vague and broad, in addition to being a bit degrading. 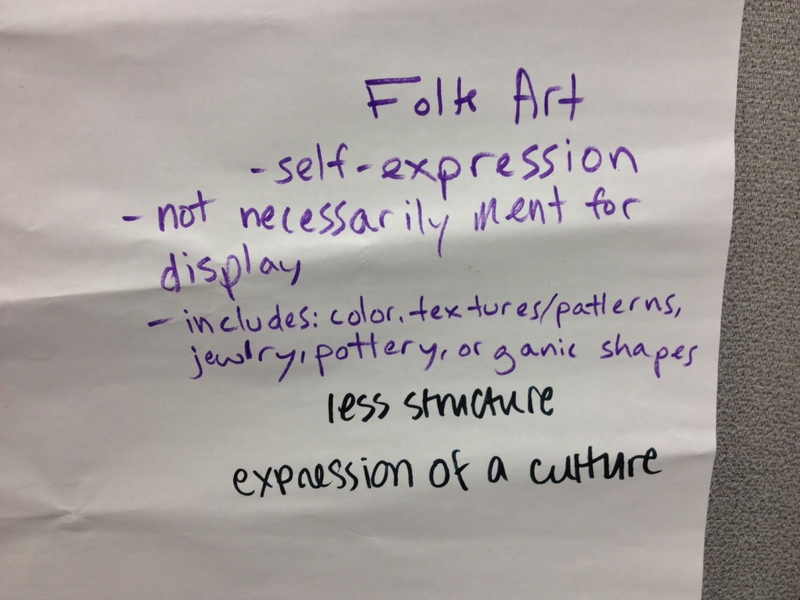 Folk art brought up some important points: it implies the expression of a specific culture, rather than art for art’s sake. It might not be meant for display–instead, it could have a use within the traditions of a group of people. We decided some art in the exhibition might perhaps fall under this category, but not all. 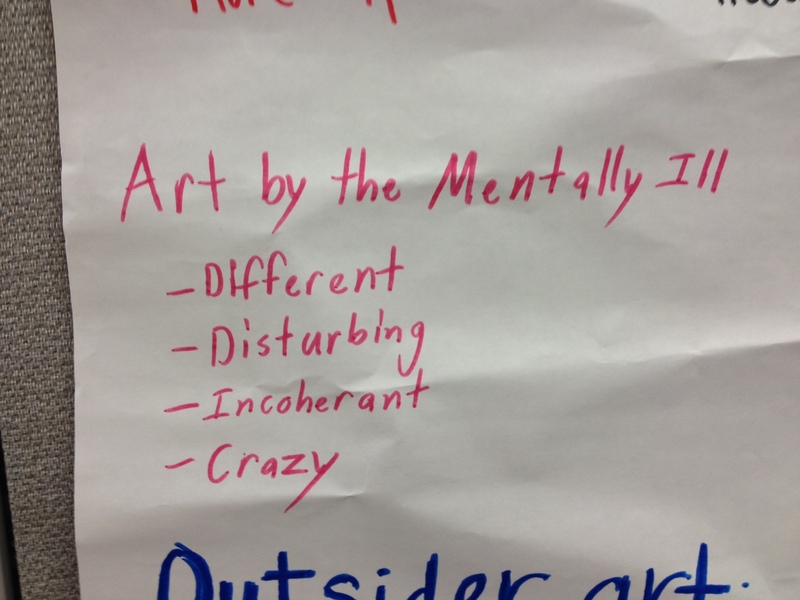 “Art by the mentally ill” is a tricky term. This group clarified from the get-go that their brainstorming definitely included stereotypes and unfair assumptions, and wasn’t what they themselves believed about the art, especially after having seen the exhibition. They worried that this term was extremely specific, and could be interpreted the wrong way if used in the wrong instance. More than anything else, as we continued looking at these terms, the word “different” kept popping up in our discussions–that these categories seemed to imply that such art was somehow separate from other art normally seen or studied in a museum or in school. Art Brut was one that we found pretty appropriate, although we did talk about the specificity of that term (did you know it was coined by French artist Jean Dubuffet?). Of all of the categories, it seemed to imply the most favorable ideas–unique, passionate, and expressive–although we weren’t keen on the translation “rough,” since it wasn’t particularly positive. 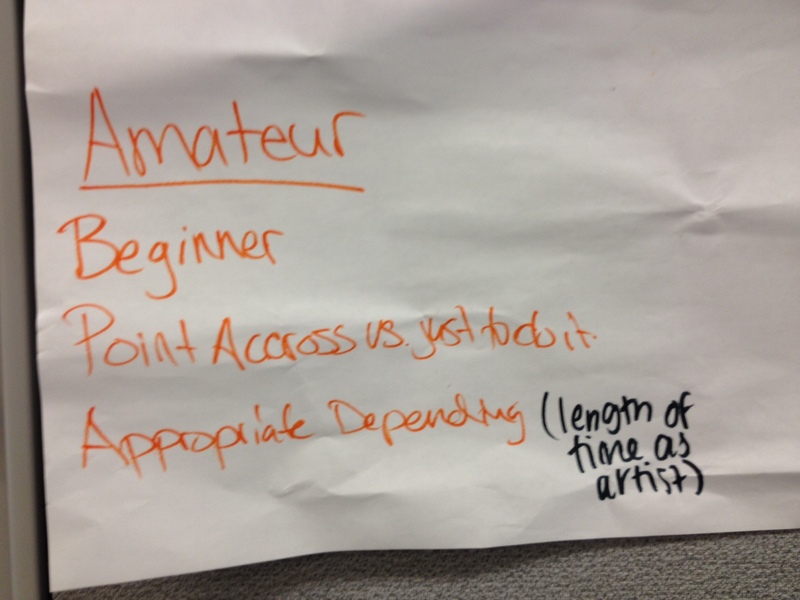 Amateur was also a tricky one–it implied a beginning artist, one who wasn’t sure how to get their point across, and had a “just do it” mentality when making marks on canvas/paper. We felt this could be appropriate depending on the artist, but wouldn’t be a good overall term. Finally, self-taught art seemed to imply that the artists had no teacher or formal training, that it might look “rough”, and that it could possibly be more expressive than mainstream art. We felt like the word “freedom” was linked to this term–that these artists might be free from conditions and traditions. As a whole we were OK with this term–maybe partly because it’s the one we tend to use here in the Museum when referring to the exhibition–but need to do some more exploring to know for sure. Not surprisingly, we weren’t able to come to any final conclusions, although I’m sure our talk this week with the exhibition curator, Margaret Andera, will help us continue to organize our thoughts. From an educator’s standpoint, I also wanted to use this activity as a brainstorming method for thinking about what issue in the city of Milwaukee we will address in our final, public artwork–to plant a seed for thought about what kinds of assumptions are made in or about Milwaukee that we might want to think more about. I’ll share more of the work of this thoughtful, intelligent group of teens on the blog throughout the course of this program. Until then, please feel free to share your thoughts on our brainstorms above. Do you agree with our assumptions? Would you challenge any of our ideas? Is there a term out there that you feel works? I’d love to bring your comments to the teens so we can keep pushing our thinking further! This entry was posted in Education and tagged ArtWorks, Gallery Teaching, Teen Programs. Bookmark the permalink.